Rad-Release | Environmental Alternatives, Inc.
EAI’s patented chemical extraction technology, Rad-Release, was developed by the U.S. Department of Energy Idaho National Laboratory then licensed exclusively to EAI, Inc. 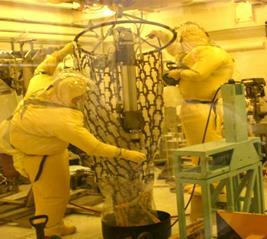 The breakthrough technology dramatically reduces the cost and risk of decontamination projects at nuclear power plants, DOE, DOD, research and weapons facilities, and other sites with radiological cleaning needs. Using this technology, EAI has achieved contaminant reduction rates of between 90% and 99%. EAI’s Rad-Release process can save millions in disposal costs, while enhancing worker safety and accelerating project schedules. EAI’s patented Rad-Release chemical extraction technology is effective for a range of contaminants, including all radionuclides, including transuranics. EAI’s patented Rad-Release chemical extraction technology is not limited to flat, horizontal surfaces as Rad-Release can be applied as a wet or dry foam allowing it to hang in place while the solution does its work. Rad-Release is effective for walls, ceilings, structural beams, and irregular surfaces such as internal piping, equipment and tools. The beauty of the foam application is the fact that large areas can quickly be covered and the foam has the ability on impact, to force itself into the tightest cracks and usually inaccessible places. After the foam has collapsed, rinse the Rad-Release away with a D.I. rinse water solution, vacuum and survey for results! On other applications, Rad-Release can be applied as a mist and left and allowed to dwell for approximately thirty minutes after a very light scrub to ensure proper contact with the surface being cleaned. Waste Minimization – Liquid waste generated, including all chemical compounds, rinse and contaminants, is generally between 0.01 and 0.10 gallon per square foot; results as low as 0.01 to 0.03 per square foot are typical for most projects. 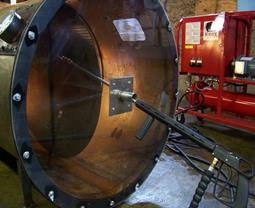 No Additional Hazards – The process does not introduce additional hazards or disposal issues. 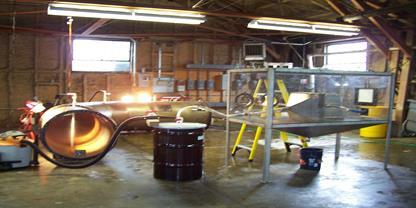 The waste stream generated can be characterized based on the contaminants extracted. 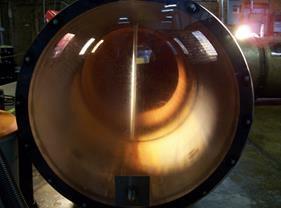 Easier Disposal – Wastes are containerized in drums, solidified and prepared for shipment to the disposal facility. Reduced Liability – By reducing the volume of waste, EAI dramatically lowers future liability. 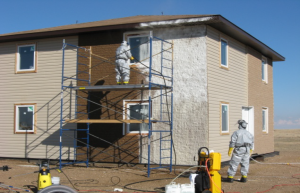 The effectiveness of the Rad-Release chemical extraction process often enables permanent “de-listing” or “clean closure” status of building surfaces and materials. Minimized Worker Exposure – EAI’s Rad-Release chemical extraction technology minimizes or eliminates airborne contaminants, is non-hazardous and eliminates the health and safety risks to workers that are common to many other chemical processes. 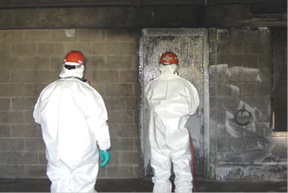 Contaminated facilities, buildings and structures can be decontaminated for reuse, de-listing or prepped for demolition quickly and effectively using our Rad-Release technology and services. All materials used in typical construction have been decontaminated with these technologies. Rad-Release works on both loose surface contamination, as well as, embedded subsurface fixed contamination. 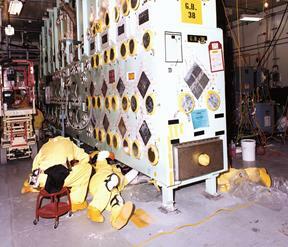 In support of the various US Department of Energy weapons facilities undergoing clean-up and D&D such as Rocky Flats, Hanford, Los Alamos National Laboratory, Argonne National Laboratory, EAI’s Rad-Release and technical support services have played a major role in accelerating the clean-up. 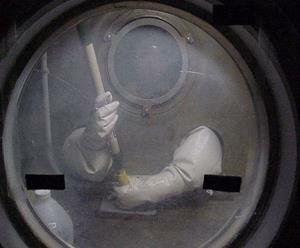 Gloveboxes, tanks and other process equipment that were high level TRU waste have been lowered to SCO and low level waste eliminating the labor intensive and costly size reduction and disposal at WIPP. National laboratories, research facilities and hot cell operators use manipulators to carry out the work in these hostile environments. 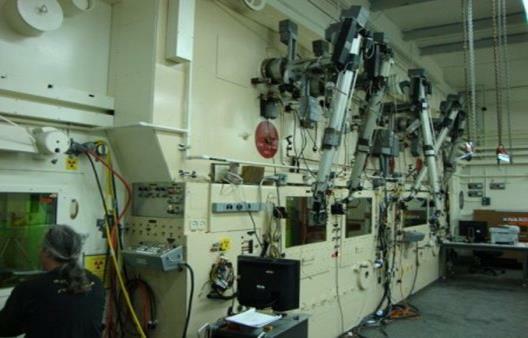 These manipulators and associated equipment fail and require routine maintenance and repairs. High contamination levels and the corresponding dose rates make these repairs difficult and dose intensive. EAI’s Rad-Release has been used to quickly lower contamination levels and knock down dose rates to allow the work to take place and improve the safety and exposure to personnel. Plant systems and piping that require decontamination for dose rate reduction can be effectively cleaned using Rad-Release foam injection, circulation and removal. Pictured below is the test set-up for removal of hold up uranium deposits from the US DOE Gaseous Diffusion cascades at Portsmouth and Paducah. The table below lists some examples of the results EAI has achieved using our Rad-Release technologies.